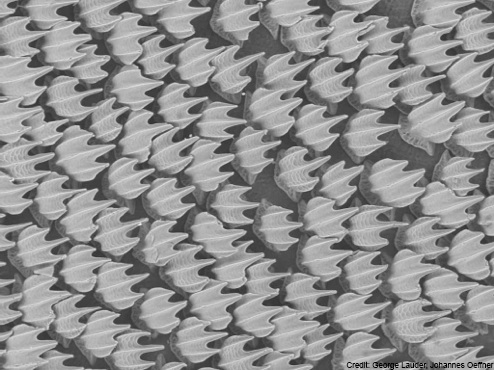 The above photo from an electron micrograph, shows denticles from a Mako shark. The interlocking design and grooved surfaces reduce friction and drag, which help water slide over the surface, enabling the shark to swim faster through water. It has recently been suggested by George Lauder and Johannes Oeffner from Harvard University, that not only does the design of denticles reduce drag, but it may also help give the shark extra thrust by cutting through the water - in effect creating a pulling power using the leading edge of the denticle. Some shark species have very thick skin, such as the Whale Shark - which may be up to 10cm thick. Sharks can heal skin wounds quite quickly, partly due to the process whereby dermal denticles are shed and replaced frequently, much like their teeth.